Featured Tattooed Mom: Jill L.
Our next Featured Tattooed Mom is also our first featured mom from Canada! YAY!! Jill is currently expecting baby #6! Scroll down to find out a bit more about our newest Moms Club member! I’m a mom of 5 kids and expecting my 6th any day now. I have 5 boys and 1 daughter. Their ages range from 17yrs down to newborn (soon). My kids love my ink. My 17 and 16 year old boys both just got their first ink also! But, they definitely think it’s great that their mom has tattoos and my 16 year old is already working on a drawing for my next piece. My sons friends think I’m a pretty cool mom and they’re comfortable around me. They say I’m super friendly and super nice. I’m organized and provide routine and structure for my kids. I’m also a high school teacher. So teaching and planned activities for my littles is pretty important. I’m not a strict parent but fairly relaxed and laid back with my kids. That things don’t always turn out the way you hope and that when they don’t you definitely need to learn to roll with it and hope it turns out for the best. If you need to leave the house by 3pm then plan to leave around 20 minutes earlier because almost guaranteed somebody is going to need to poop before you walk out the door. No, I actually get a lot of compliments about my ink from women of all ages. I haven’t had anyone discriminate against me for my ink. My race is a different story but definitely not my ink! I have a sleeve that’s currently a work in progress. I got pregnant before it was finished so I put it on hold to have a baby and will finish it after I’m done breastfeeding. It’s a collage of things that flow together that represent me as a person. From my career, to my passions of art and music, my favorite flower, my military husband, my Aboriginal name, to my Aboriginal culture. It’s a work in progress but I think it’s amazing. This was created by myself but put on my arm by Lee from Capital Tattoo in Edmonton, AB. On my left hip close to my uterus is a tattoo of a weeping mother holding her baby to represent the miscarriages I’ve gone through, for the babies I never got to hold. This was by Jenn Danger from Urge 2 Tattoo in Edmonton AB. And lastly below that is a closed rose that represents an abortion I was forced to go through when I was a teenager. It represents a child that was created but never had the chance to bloom. This was done by Marty from Live Once Tattoo in North Bay ON. My most favorite piece is the unfinished horse on my sleeve, I absolutely love horses. I got my first tattoo when I was 24, it was a closed rose on the inside of my hips. My favorite hobby is sewing. I sew clothing for my kids, moccasins, Mukluks, and mittens. I also have a passion for art as I am an art teacher and I enjoy drawing and painting to relax and am currently trying different things to find my unique style. You’re a new addition to the crayon box, what would the name of your color be and how would you describe it? I am the color Stoarey. At first glance in the box I blend in with the other colors but when I’m taken out and pushed on paper my true colors come out. I’m a touch of red for the love in the family I have created, a tinge of blue for the sadness I’ve faced, a hint of green for the success I’ve accomplished, and a hue of purple for the beautiful woman I have discovered within myself. These things combined all create a beautiful Stoarey. 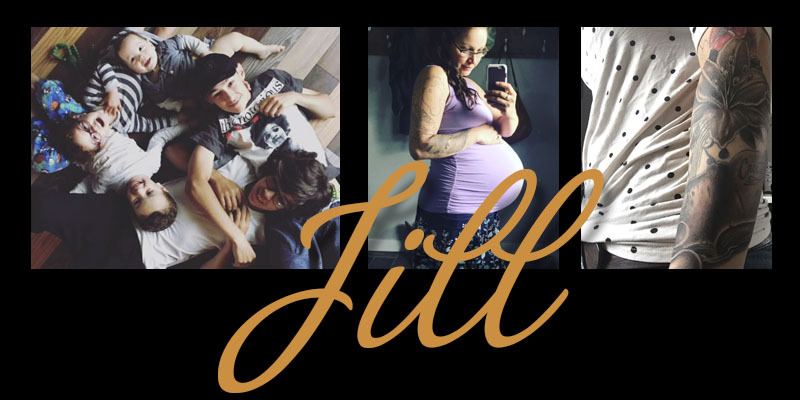 Thanks so much for sharing a bit of your story with us, Jill!! We’re happy to have you as part of the Moms Club!! All featured moms are part of the “Moms Club” and you can find all of their posts in the Moms Club category. Get to know the moms in the club – they’re all amazing! Prev post Featured Tattooed Mom: Trina H.
Next post Featured Tattooed Mom: Tracey R.